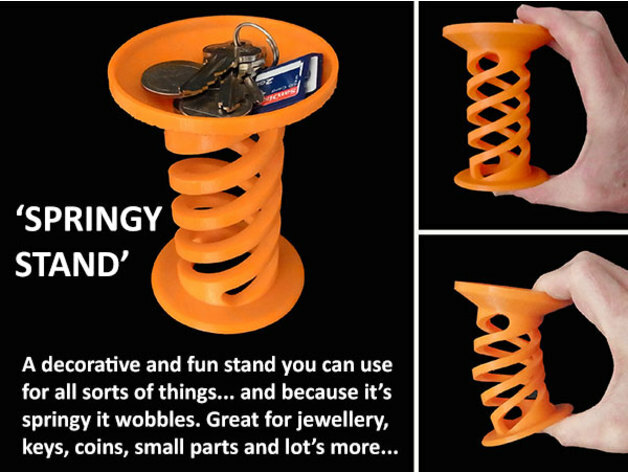 Springy Stand #3DPrinting #3DThursday « Adafruit Industries – Makers, hackers, artists, designers and engineers! muzz64 shared this project on Thingiverse! It looks great as a decorative stand to put small things on but it also wobbles and bobbles because it’s springy. How springy it is depends on how much infill you apply… if you plan to use it for coins or light weight jewellery you can use minimal infill but to hold things like men’s watches you need quite high infill (…or to place it in a very well balanced way). This is a fun little stand that is approx. 110mm tall and uses 70gm filament at 50% (max. recommended) infill with a Raft. The less infill applied the more the stand will spring and bobble around… great for lightweight things but a firmer spring is required for heavier things so increase your infill. The recommended range is from 15 to 50%. Seeing how much the infill percentage changes how firm the spring is and how much weight it will support is interesting as well… the difference from 15% to 50% is significant to say the least. If you only intend on using the ‘Springy Stand’ for light weight things and want it to wobbly use 15 – 20% infill… but if you want it to support a heavy mans watch use40- 50% infill and it will be a far more rigid spring.